"Sales" bring in revenue, clear out inventory, increase foot traffic, and invite trial by providing purchasers with a "better deal". “Sales” also decrease perceptions of quality, encourage differed purchasing, diminish profit margins, and harm brands. I am not a pricing strategist. However as a brand strategist pricing intersects with my work in a fundamental way by affecting the perception of value. The studies are clear on this: A discounted or sale price tells a customer that the lower sale price and not the original price is the "true price". While price reductions for artificial reasons improve transaction utility by reducing acquisition cost (I get the same thing at a lower price) they also encourage customers to adjust quality assessment downward and question value claims associated with your offers. In this way arbitrary price reductions reduce the probability of future purchase and encourage [read more]customers to defer purchases to when products are priced closer to their "true value". Brand boils down to the expectation of value associated with something you’re going to interact with. The clarity of expectation improves transaction value by reducing risk associated with purchase utility. This allows the branded offer to command a price premium and is why marketers bother to brand anything in the first place. Arbitrary discounts have a proven conflicting impact on transaction value but what about the impact on brand value? If a brands pricing isn't true are its promoted values its real values? Can the brand be trusted to be a fair and honest employer or supplier? Will they honor their warrantees? Will future claims of value be any more reliable than the current ones? The reliable answer is that arbitrary sale has adjusted expectations to be more uncertain. So what should you keep in mind when contemplating a temporary pricing adjustment? Here are two questions to help you identify if you’re doing it right: 1. Do you have you a clear articulation of value relative to competing offerings that is both distinct and makes a real difference for your customer? 2. Do pricing differences between offers reflect genuine differences in value being delivered to your customer? If you can't answer yes to both of these questions you need a branding intervention. The real solution to increasing revenue lies in increasing value. Yes this can be done tactically with gifts with purchase, bundling services, and improving return policies. But it can be done even more effectively by creating clear value distinctions in the first place. To sum it all up: If your price differences are about measuring the depth of your customers wallet or your need for revenue - you are doing it wrong. 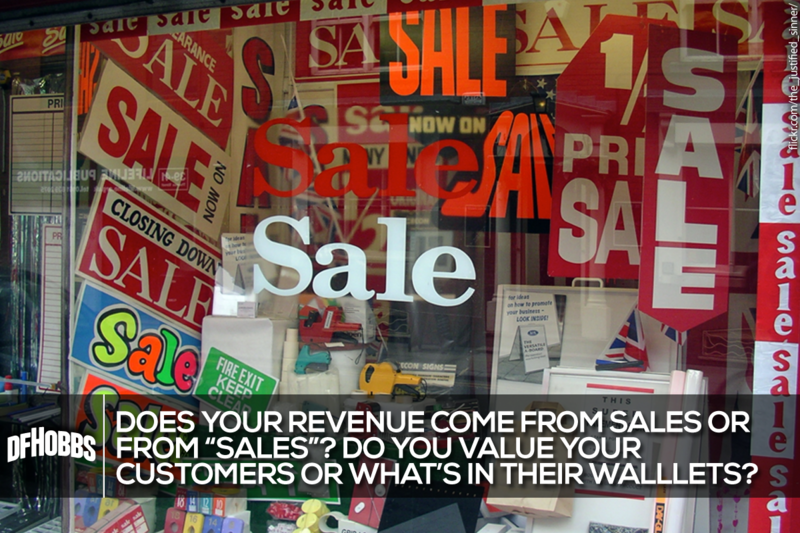 Real sales come from offering real value at a real price. Articulate better the value being delivered. Honor past customers by holding to the price they paid as much as possible. To spur sales offer additional value (not lowered cost). If to capture more market you must offer different price points offer different value. If you have a legitimate reason to drop the price, drop it. (Model/Technology becomes outdated, Close out inventory, Damaged goods, Factory seconds, Irregulars, Advance order discount, etc.) But make sure you had a legitimate reason to set your price in the first place.